46100 PROTEMP II A3 RECONST.TEMP. 46430 PROTEMP II CATALIZ. 2.4gr. 46954 PROTEMP 4 GARANT REPOS. A1 50ml. 46960 PROTEMP 4 GARANT REPOS. B3 50ml. 50614 Coronas Bicuspide Sup. Gran. 5U. 50615 Coronas Bicuspide Sup. Peq. 5U. 50616 Coronas Bicuspide Inf. 5U. 50617 CORONAS CUSPIDE GRAN. 5u. 50618 CORONAS CUSPIDE PEQ. 5u. 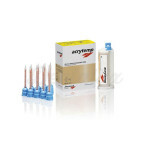 CORONAS PROTEMP MOLAR INF. GRAN. 5U. Coronas Protemp Molar Sup. Gran. 5U. Coronas Protemp Molar Sup. Peq. 5U. DENTALON PLUS POLVO LIGHT 100gr.